By December 2017, it is revealed that the cumulative investments in the top five FinTech subsectors in ASEAN has reached beyond US$700 million, with the payments sector leading the way with US$269 million. The ASEAN market in general has seen a greater adoption of various FinTech services, as both startups and major banking institutions come up with their own innovative solutions. Of all these countries, Singapore comes out on top as a hotspot of FinTech industry, with 490 registered FinTech companies and US$141 million investments raised in December 2017 alone –a 68 per cent increase from the number in the previous year. In addition to funding, its government has also been “proactively backing” the push for FinTech adoption and has even set up regulations to encourage innovation in the sector. Such support can also be seen through events such as the upcoming Singapore FinTech Festival 2018 (SFF) by Monetary Authority of Singapore (MAS). Returning for the third time, SFF will be held on November 12-16 at Singapore Expo. The event will bring back popular segments from previous editions such as FinTech Conference & Exhibition, FinTech Investor Summit, Global Fintech Hackcelerator, FinTech Awards, and the Innovation Lab Crawl. It will also introduce new elements such as the ASEAN FinTech Showcase, which will highlight FinTech developments and opportunities in ASEAN and a showcase of innovative solutions from ASEAN countries, and Artificial Intelligence in Finance Summit, which will explore emerging AI solutions in trading, investment management, customer service, and risk management. The theme will also include discussions on quantum computing as well as governance and ethics in the application of AI. 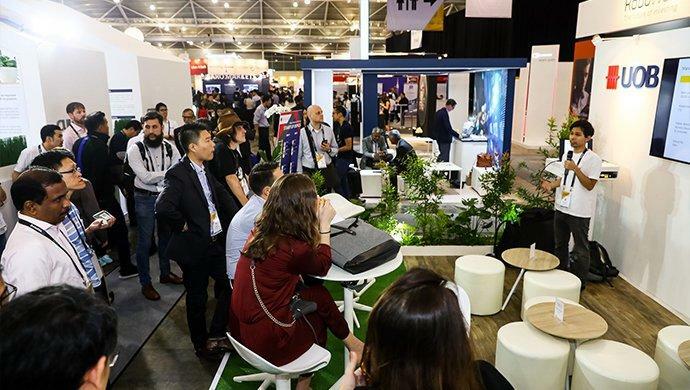 “The Singapore FinTech Festival has grown in scale and scope over the past two editions, and has contributed to the growth of the FinTech ecosystem in Singapore and the region. We look forward to welcoming FinTech players and stakeholders from all over the world to Singapore, and to work with them to create new value and promote financial inclusion through innovation, digitalisation, and connectivity,” said MAS Chief FinTech Officer Sopnendu Mohanty. SFF also expects to attract up to US$12 billion of capital for ASEAN enterprises, as 380 investors had confirmed their participation in the event by singing up to its deal matchmaking platform MATCH. When it comes to discussion on how to build the fintech ecosystem in Southeast Asia, the most common theme to show up is collaboration between industry players –from startups to financial institutions. For UOB, which is one of the banks that will be heavily involved in the SFF, events such as this is an opportunity to showcase the various FinTech solutions that the bank has supported or implemented in its suite of digital solutions. Through its network and extensive in-country capabilities across ASEAN, the bank believes that it is uniquely positioned to provide financial solutions to help customers manage their day-to-day and future needs. The event is also seen as an opportunity to meet with fellow industry players, and learn more about how they can help each other, explore new solutions, and meet tech companies to learn how new innovations or solutions can be implemented. Bearing this year’s theme “Powering innovation across ASEAN”, UOB will have booths at the exhibition hall showcasing its innovative banking solutions, its accelerator programme The FinLab, and coworking programmes. Tookitaki – a collaborative effort with RegTech firm Tookitaki to combat money laundering. The holistic machine learning solution developed from this partnership enables UOB to draw out information more precisely and quickly to prevent and detect suspicious money laundering activities. Synagie – a partnership that helps small and medium-sized enterprises (SMEs) expand into and manage multiple online sales channels more effectively for business growth. UOB’s collaborative agreement designates Synagie as the Bank’s preferred commerce-enabling partner. MightyFX – This collaboration with MightyFX enables customers to trade and to transact quickly and conveniently in 11 currencies without being charged any currency conversion fees. Car and Mortgage Loans – through UOB’s fully digital car and home loan solutions, buyers no longer need to furnish paper documents or have to wait for days for the loan to be processed. UOB BizSmart – a cloud-based, integrated business solution to help SMEs harness technology to boost their business performance. EzyProcure – As part of the UOB Bizsmart solution, F&B businesses can digitalise their entire inventory and supplier management process. They can also tap on UOB’s Virtual Payment Solution to pay for their purchases immediately with interest-free credit, extending their credit cycle and overcoming their cashflow concerns. In addition to the exhibition, UOB will also participate in various panels sessions and talks across the first three days, featuring senior managers such as Susan Hwee and Janet Young, industry partners such as OurCrowd (Denes Ban), and The FinLab itself. UOB’s involvement in the Singapore Fintech Festival will culminate in The FinLab’s Innovation Lab Crawl on the 15th November 2018. Indeed, the future looks promising for Fintech in Singapore, what with global banks such as UOB playing a major role in the collaborative efforts spearheaded by the government. The post How collaboration is going to propel the ASEAN FinTech industry forward appeared first on e27.